The famous Tofukuji temple in Kyoto is one of the most popular fall foliage spots in all of Japan. 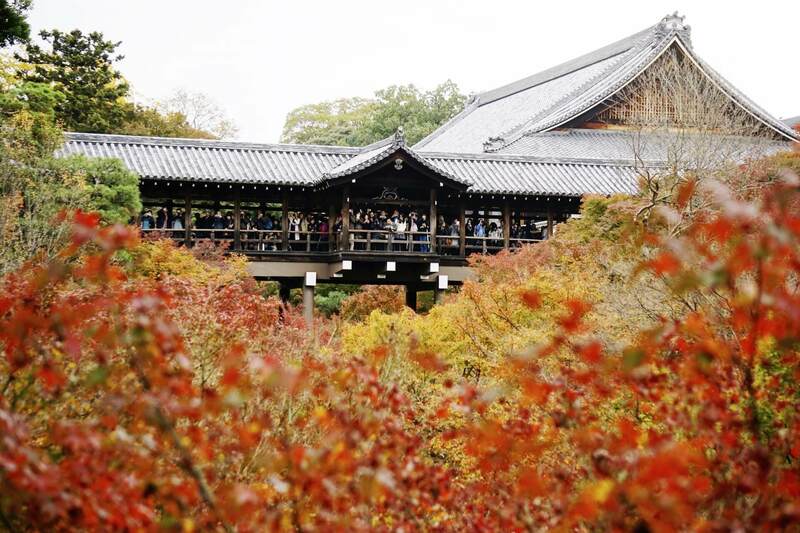 Typically, any list of autumn leaf viewing spots will have Tofukuji listed right up top, and for good reason. 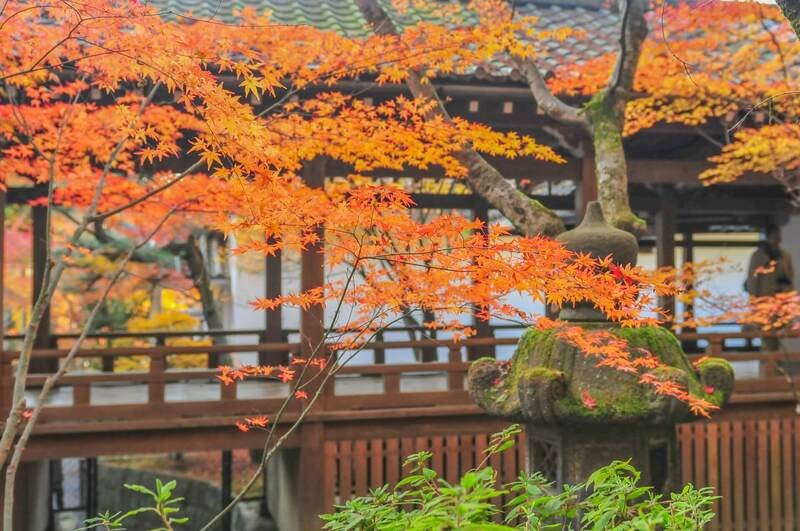 Hundreds of Japanese maple trees fill the vast temple grounds with a sea of red and orange, and the Tsutenkyo Bridge offers an impressive view of both the beautiful temple and the entire scenic landscape. Mount Nasu (aka Nasu-dake) refers to a group of volcanoes located in the northeast part of Nikkō National Park. 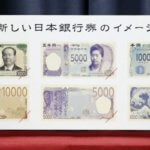 Mount Nasu is one of the 100 most famous Japanese mountains, and the tallest peak is the 6,289 feet-tall Sanbonyari Peak. 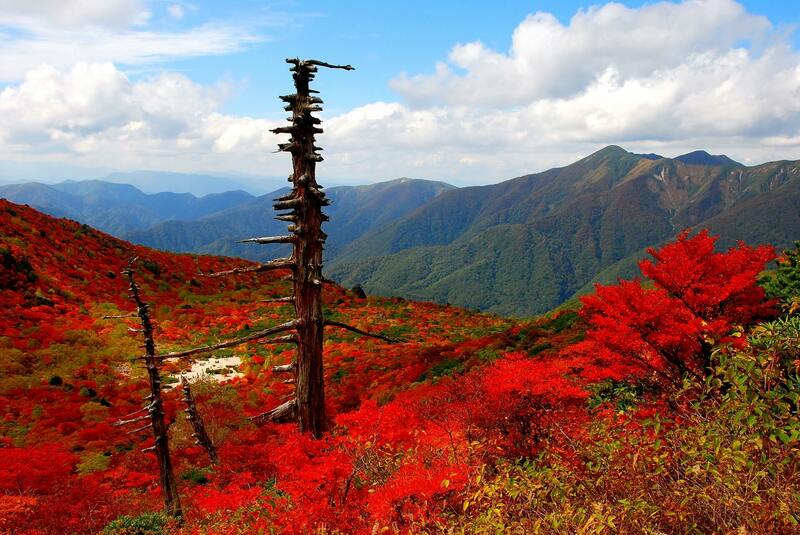 Nasu-dake is a very popular destination year-round, but especially in autumn, as this mountainous region is one of the best places to view endless fall colors. Visitors can take the cable car up the mountain and gaze down at the sea of colorful treetops below. From the top of the cable car, it is a one hour hike to its peak. Not only is Rikugien Garden known as being one of the most beautiful landscape gardens in all of Japan, but it is also Tokyo’s most visited autumn leave spot. Rikugien is an Edo period garden that was built in 1702 and restored in 1878, and the elegant historical atmosphere combined with the beautiful fall foliage is an incredible collaboration. The garden is opened at night for special illuminations during the peak of the season from late November to early December. The colorful maple trees surrounding the garden’s lake are illuminated so that they can be enjoyed even after the sun has set. 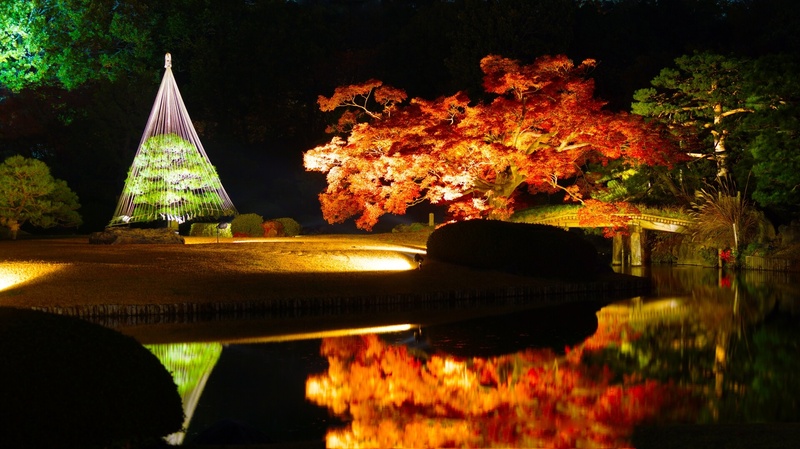 The lights and leaves reflect almost magically upon the surface of the lake, making the fall illumination an immensely popular event in the heart of Tokyo. Eikan-do Zenrin-ji (永観堂禅林寺) in Kyoto is the head temple for the Seizan branch of Japan’s Jōdo (Pure Land) Buddhist sect. It is sometimes called “Eikan-do” (永観堂) meaning “Hall of Yōkan”, or just called “Zenrin-ji (禅林寺), which means “Temple of Forest of Zen”. Eikan-do is famous for its fall foliage. The temple grounds feature a stone bridge, a pond, a zen garden, and hundreds of orange and red Japanese maple trees. At night, the trees are illuminated by dozens of lights, creating a beautiful scene that is reflected on the surface of the pond. Actually, all 5 lakes at the base of Mount Fuji are incredibly popular fall foliage spots, but the title for most popular goes to Lake Kawaguchi (河口湖). People from all over the world come to visit the Fuji Kawaguchiko Autumn Leaves Festival (富士河口湖紅葉まつり) and see the colorful autumn leaves found all around the Lake Kawaguchi area. 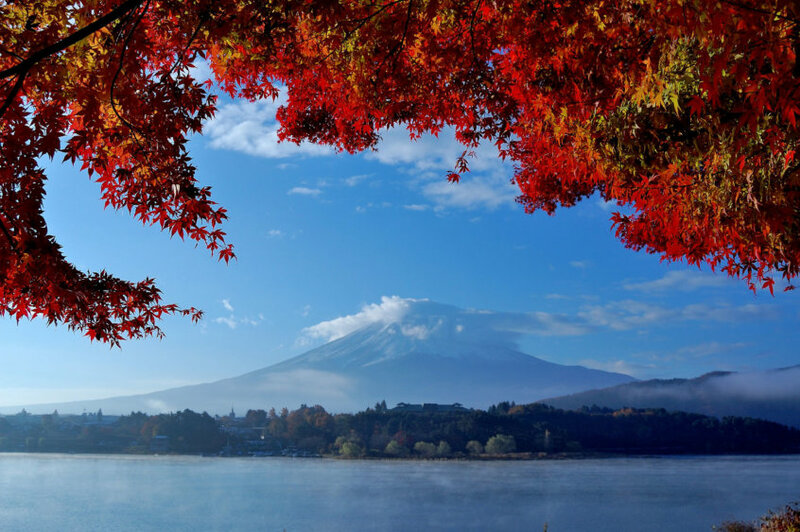 The amazing scenery of the lake includes the view of Mt Fuji in the background. The most popular autumn leaves spot around Lake Kawaguchi is the Momiji Kairō (もみじ回廊), a 2km-long “Maple Corridor” of over 60 colorful maple trees. After the sunset around 4:30pm until 10 pm every night, the trees are lit up so that visitors can enjoy walking under them even when its dark. Oirase Stream is a stream that flows from Lake Towada, which is the largest crater lake in the mainland of Japan, located in Aomori Prefecture. The clear stream is a 14 kilometer long flow of typically gentle water that zig-zags beautifully between boulders and trees, with occasional waterfalls. Visitors come to enjoy the peaceful scenery here throughout the year, but the entire area is dyed in vivid colors of red, orange, and yellow during the autumn leaves season. It’s no surprise that this incredible place is one of the country’s most popular hiking destinations during the autumn season. Nikkō is a town located at the entrance to Nikkō National Park. 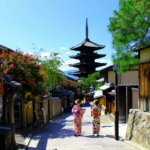 It’s one of the most visited historical sites in Japan and a very popular tourist destination all year round, especially in autumn. Nikkō is a beautiful town that offers several incredible fall foliage viewing spots, such as the Chūzenji Lake, the Irohazaka slope, and the Kanmangafuchi Abyss. The most popular autumn leaves spot is the famous Nikko Tosho-gu Shrine, which is also registered as a UNESCO World Heritage Site. The wonderful scene of the autumn leaves can be seen from the sacred Shinkyo Bridge of Nikkō Futarasan Shrine. 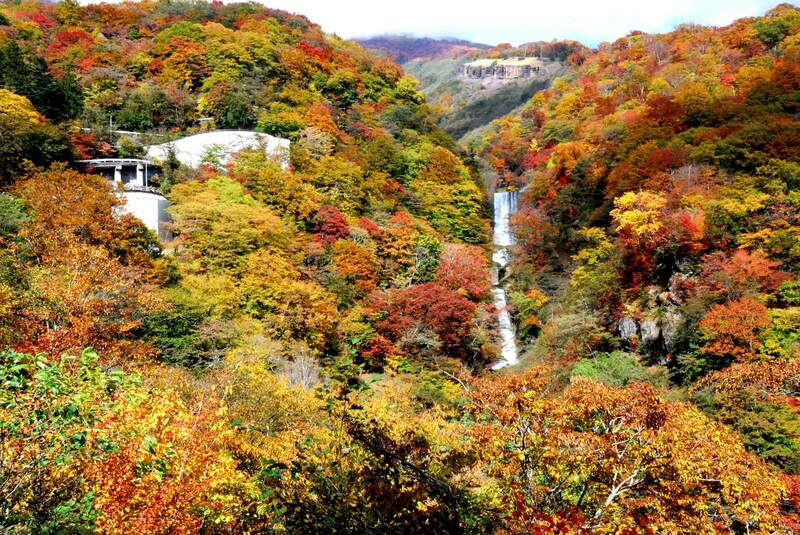 And, from Kegon Falls, there’s also a million-dollar view that includes a 100-meter waterfall as well as the autumn leaves. The ginkgo tree, known as ichō in Japanese, is the official tree of Tokyo, and it can be found along many of the city’s streets. The most famous gingko avenue is Meiji Jingu Gaien (明治神宮外苑), which is the most popular spot for viewing autumn ginkgo leaves in the central area of Tokyo. 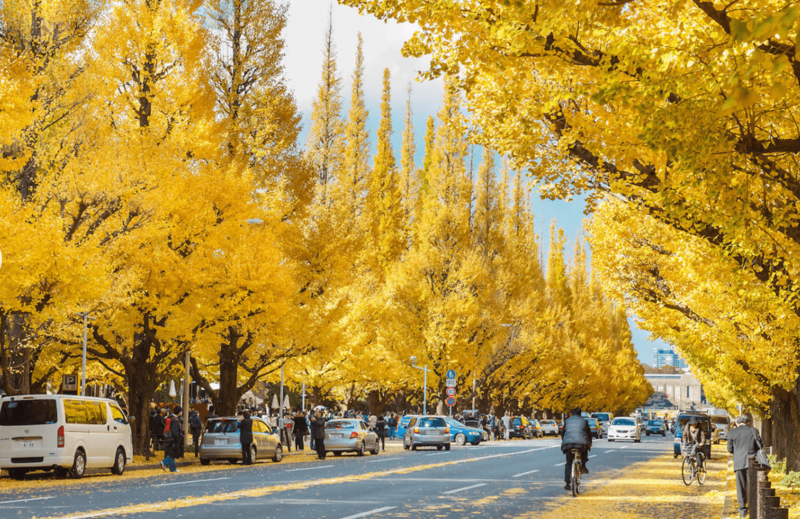 Two lanes of approximately 150 Ginkgo trees are lined along a beautiful 300 meter stretch. The best viewing time is a span of about 2 weeks starting in the middle of November, and during this peak season, the Jingu Gaien Ginkgo Festival “Ichō Matsuri” (神宮外苑いちょう祭り) is held from 10am to 5:30 pm. After the peak season ends and the leaves all fall from the trees, they blanket the ground in a way that creates a gorgeous natural golden carpet. Arashiyama is a charming, touristy district located on the outskirts of northern Kyoto that has been a popular destination since the Heian Period (794-1185). 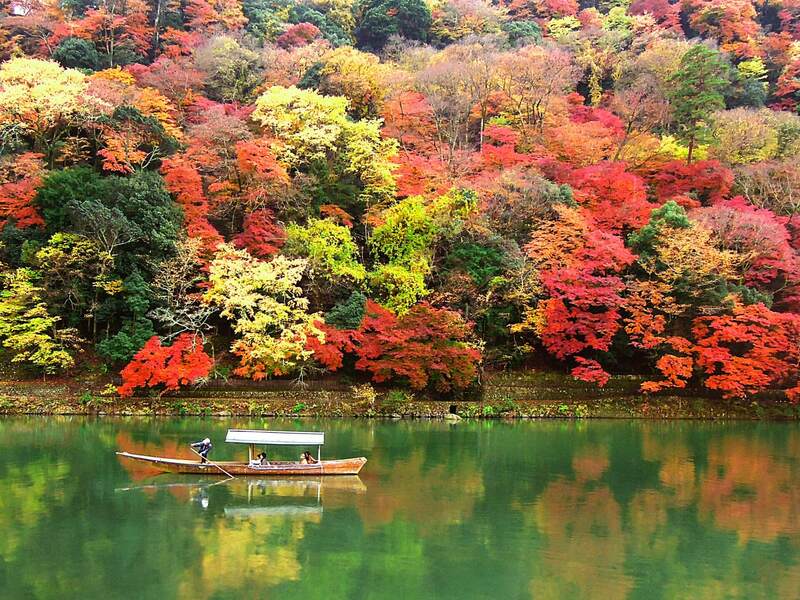 Arashiyama is particularly popular during the fall color seasons. The Togetsukyō Bridge is Arashiyama’s well known, central landmark, and the view of the autumn leaves from the bridge over the water is incredible. People can enjoy the scene from boats that are available for rent on the river. Other very popular fall foliage spots include the Tenryuji Temple, and Arashiyama’s famous bamboo groves, which are illuminated at night. 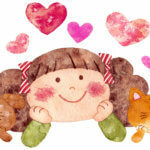 The area north of central Arashiyama is also known as Sagano. The Sagano neighborhood offers views of mountains blanketed with multicolored trees, which are best enjoyed from a ride in the Sagano Scenic train. Kurobe Gorge, located within the Japan Alps in Toyama Prefecture, is known for being the home of Japan’s best scenic railway. 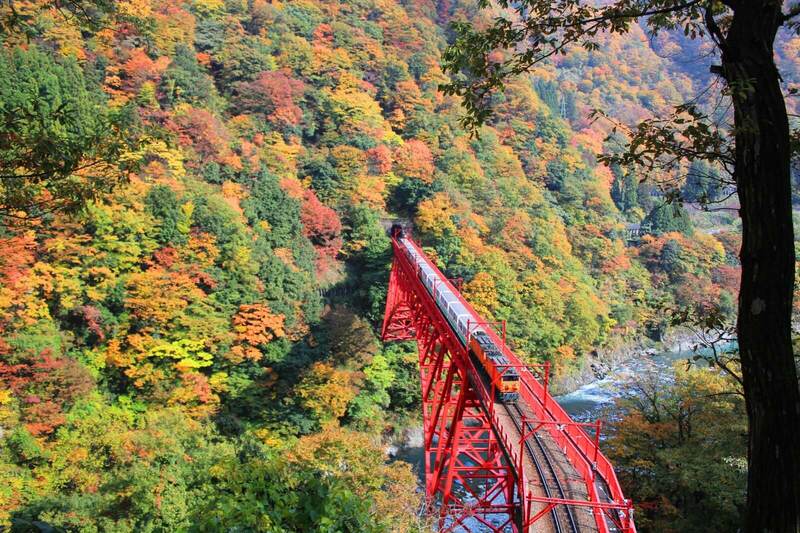 The famous Kurobe Gorge Sightseeing Train runs from April to November, and is most popular during the incredible fall foliage season. 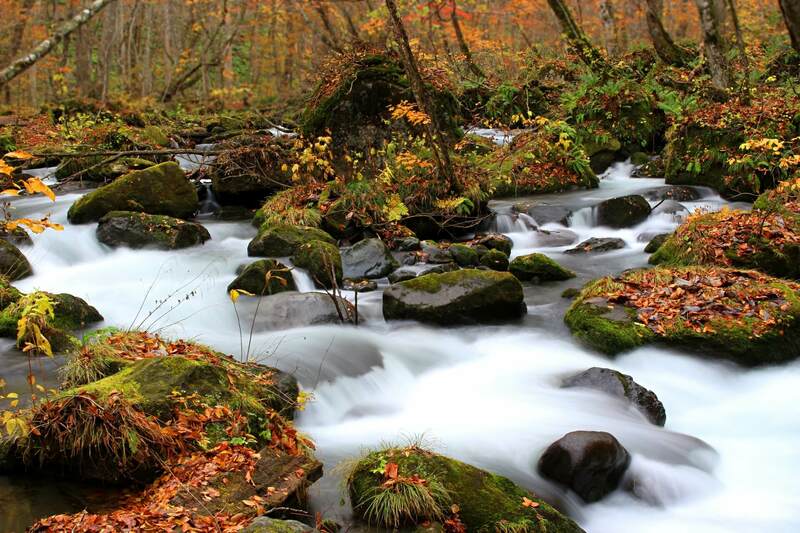 Since the mountains cover a large elevation range, the Kurobe Gorge enjoys an unusually long fall color season which usually runs from mid October to mid November. The train’s 80 minute ride features 20 kilometers of scenic track that leads across more than 20 bridges and 40 tunnels through the deep gorge. The trains stop at a few stations along the way where visitors can get off and take photos.